The main question many people in business want to know is what is the better social media network for their business, Facebook or Google Plus? Luckily, there are benefits for using both of them. 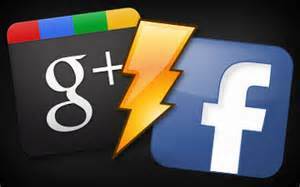 Let’s compare the benefits of using both Facebook and Google Plus. First lets look at Facebook. Facebook has been around longer, which means more people are familiar with the network. Facebook has a very large amount of users. Facebook also has plenty of third-party apps that many businesses would be successful using. These apps take businesses step by step showing how to get started on Facebook and what they can do to help get their business more awareness. Facebook makes it incredibly easy for companies to promote their business by allowing them to interact and connect with consumers, such as having contests. Now lets look at the benefits of using Google Plus. When using Google Plus, it allows the business to target potential customers based on certain interests. By doing this, it makes it easy for businesses to deliver their information to individual markets. Google Plus also has incredible analytics on their brand pages. Using Google Plus also increases the businesses search rankings since Google owns Google Plus. So there it is, the benefits of using both Facebook and Google Plus for your business!